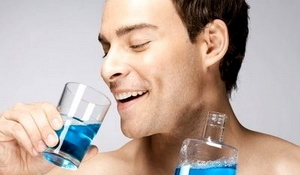 Mouthwashes or mouth rinses have been around for ages and are most widely used by consumers. The traditional purpose for mouthwash has been to keep bad breath away but now there are therapeutic mouth rinses available that help reduce the amount of bacteria in the mouth. Mouthwashes usually contain active agents, flavoring agents, astringents (to give your mouth an invigorating sensation), ethyl alcohol (as a solvent, taste enhancer and for after taste) and water. Some may also contain sodium (salt). Alcohol containing mouthwashes can be dangerous if ingested by small children and should be avoided for recovering alcoholics, dry mouth and drugs that reacts with alcohol. Many newer brands are alcohol-free so make sure you read the label before purchasing. Mouth rinses can be broadly divided into two types: cosmetic mouth rinses and therapeutic mouth rinses or a combination of both. Cosmetic mouth rinses help reduce bacteria in the mouth, provide short-term control for halitosis and leave your mouth feeling fresh. They are generally used by people suffering from bad breath and dry mouth (xerostomia). Though many mouthwashes claim to stop oral malodor, the effects caused by the flavoring agents in the content will disappear after 3 to 5 hours. It is best to identify the actual cause for the bad breath and treat it. Dry mouth can be due to damage to the salivary glands, Sjogren’s syndrome or medications therefore artificial saliva is used to moisten the mouth. The FDA approved prescriptive plaque-control rinses contain 0.12% of chlorhexidine gluconate and the proper way to use it is to rinse twice daily for 30 seconds with 0.5oz (15ml) of solution after brushing. So far chlorhexidine gluconate mouthwash is the most effective anti-plaque and anti-gingivitis to date. Chlorhexidine is a cationic compound that binds to the tooth surface, plaque bacteria and soft tissues of the mouth thus inhibiting bacteria colonization. The ability of the oral tissues to absorb chlorhexidine gluconate allows it to be slowly released in active form over 12 to 24 hours. Chlorhexidine gluconate is used to help control gum inflammation and plaque. However it is not the sole method to heal gum disease for chlorhexidine gluconate does not penetrate thick layers of plaque and it could not reach the depth of gum pockets. Staining. 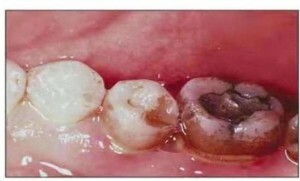 Chlorhexidine can stain teeth, oral tissues and tooth-colored fillings brown by binding to dietary factors and the stains could only be removed by scaling. Therefore chlorhexidine gluconate mouthwash should be used only up to two weeks and intake of tea, coffee, red wine and smoking should be avoided during use. Learn how to remove tooth stains here. Altered taste. Chlorhexidine gluconate mouthwash should be used after meals for better food appreciation. Avoid rinsing with water immediately after use for it removes the flavor-masking agent and will result in a bitter taste. Chlorhexidine gluconate is inactivated by dentifrice (paste, liquid or powder used to help maintain acceptable oral hygiene) substances therefore avoid use 30 minutes before and after regular tooth brushing. during post-operative healing period of surgical dental treatments. Mouth rinses containing essential oils like Listerine® are available over the counter and usually contain menthol, thymol, eucalyptol and methyl salicylate which are phenolic compounds. 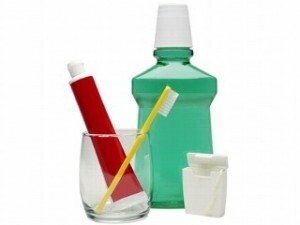 The mouthwash should be rinsed twice daily for 30 seconds with 0.7oz (20ml) of solution after brushing. Essential oil mouthwash has nearly similar properties with chlorhexidine gluconate mouthwash but without its side effects and is a cheaper alternative. However some may complain of bitter taste, possible staining and burning sensation on use. There have been concerns over its carcinogenic potential due to its high alcohol content but ADA has reported that there is insufficient evidence to link oral cancer and alcohol mouthwash. Mouthwashes serve as a popular and simple delivery method of active agents that rid the mouth of bacteria and to rinse food debris from the mouth. However that does not mean that usage of mouthwash eliminates the need for brushing and flossing as using a mouthwash only serves as a part of your daily oral cleansing regimen. On a tight budget? No worries. Learn how to make your own mouthwash. I’ve used a Gripit Floss Holder – http://www.gripit.biz – for 35 years to make flossing faster and easier and complement mouth wash. These handy devices come with their own floss supply that can be advanced in seconds and refilled from local drug and grocery stores. They last a lifetime and don’t clog landfills.